I heard a story on the television news last night about research into people who drink coffee. Apparently if you regularly drink three to four cups of coffee a day, your risk of getting diabetes is reduced. The theory was that people who drank coffee did so as an energy boost, so they were more active and being active was what reduced their risk of diabetes. I didn't catch who did the study, how it was done, or how many subjects there were, so I can't tell you how reliable or otherwise the research was. I do drink three to four cups of coffee per day, but I'm not sure I get the same health benefits from it. You see, I drink two cups of coffee at breakfast time to get the energy to eat breakfast, take my pills, and think straight to do a little bit on the computer. If I'm lucky, I'll still have enough energy to put a load of dishes in the dishwasher. That's about as far as two cups of coffee takes me, before I need a nap. 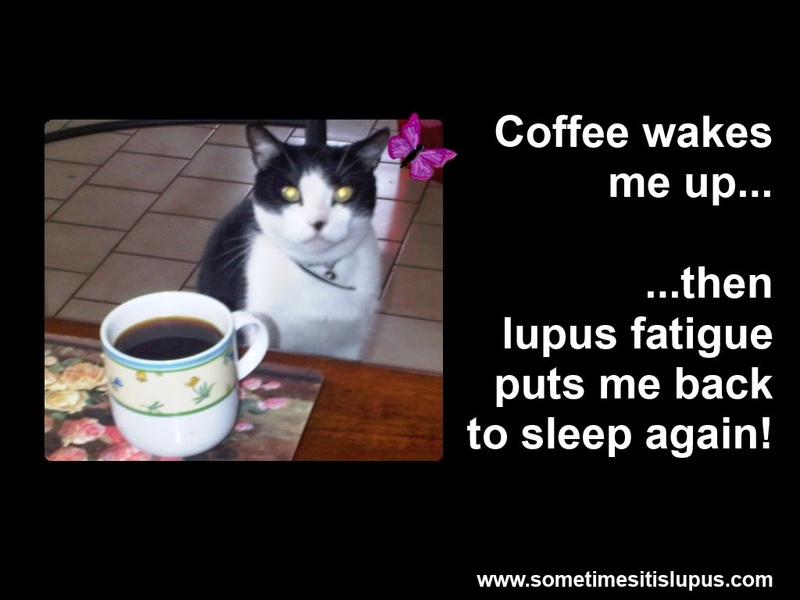 Lupus fatigue is more powerful than a simple stimulant like coffee... so even when I get myself thoroughly caffeinated, there's a limit to what I can achieve before fatigue takes over again. In my house, running out of coffee is a disaster. It means nothing gets done, not even thinking, as fatigue makes my brain fog far worse. Well, my coffee cup's empty again, so I'm off to lie down. See you later. I wish coffee did something for me... I feel the same whether I drink a bunch or none. Though it does eventually give me the jitters and shaky hands if I have too much!